When I was a kid, it was rare for me (or my friends) to be sitting around staring at screens. We'd go outside, or play with toys or build stuff. We had a little help though, such as parents who encouraged us to get outside -- and in my case, I had a lot of craft and activity books. My favorite craft/activity book contained recipes, art projects, decorating ideas and other activities. It really inspired me to try all sorts of new things. For example, I made a dollhouse out of magazine scraps, painted melted chocolate chips onto leaves (in an attempt to make chocolate leaves), built forts and so much more. I read through my favorite book hundreds of times and it was a definite childhood creativity asset that didn't require parent participation. This in mind, if you're looking to encourage your own kids to cut back on screen time and spend more time being creative, I'm positive that a good book or two can help. Below are 15+ awesome books for various stages of childhood that can help get your kids' creative juices flowing and keep them active and independently engaged both at home and in the great outdoors -- all summer long and beyond! How to Be an Explorer of the World by Keri Smith is one of my favorite books of all time and my son likes it a lot too. This book rocks because it’s amazing for the whole family, not just a specific age group. Far too often we ignore the world around us, but this book challenges everyone to observe their world with their eyes wide open. Smith pens various missions that kids and adults can embark on, such as, “Document and observe the world around you. As if you’ve never seen it before. Take notes. Collect things you find on your travels. Notice patterns. Copy. Trace. Focus on one thing at a time. Record what you are drawn to.” The book is highly interactive and contains a slew of amazing hand-illustrated images and photos in shades of black, white, gray and orange. Excess space is offered so that kids can jot down their own ideas and thoughts as well – this book is meant to be used for drawing in, keeping graphs and lists and lots of doodling. Many activities have a “get outside and be active” slant as well, encouraging life participation vs. passive reading. Some prompts include: Start a collection of the first thing you see outside today; sculpt with found objects; collect objects you don’t understand; collect multiple rocks – then line them up and find their differences; pay attention more. Smith has many other amazing books (we own a few of them) that encourage kids to explore and think outside the box. Below are some of her best. Age level: toddlers to elementary aged kids. I recently got a copy of this book and it’s amazing. The style is casual and very easy to browse, which is good since there are so many activities included. The book is divided by seasons, making it a great year-round outside activity guidebook. 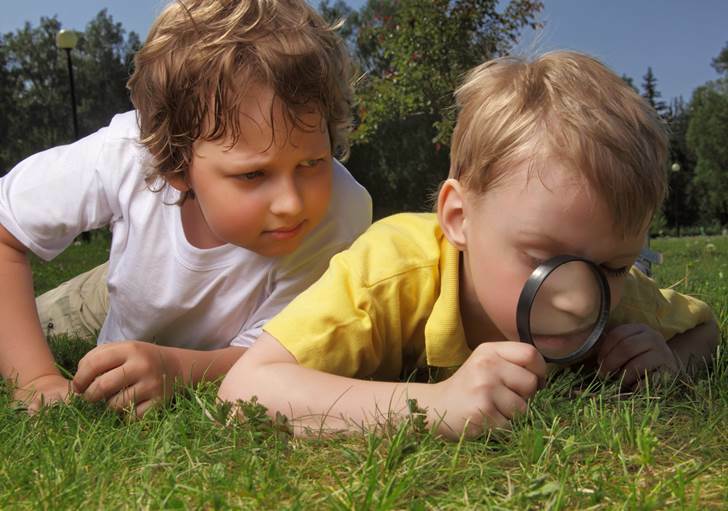 Ideas include catching fireflies; making bird feeders; playing marbles; gardening; building a snowman; and so much more. One of the coolest things about this book is that it’s designed like a checklist, so kids can actually mark off activities they try. Plus there are added features including fun outdoor destinations and extra resources for parents. Two things you should know about this book. One, some of the activities may seem so simple that you question why such a no-brainer was included. However, kids today don’t get outside like we did. Stuff that seemed easy to our generation is often foreign to today’s kids. Don’t let that turn you away from this book. Secondly, this book is most appropriate for younger kids. My 12 year-old son already gets outside a lot and he found many activities in this book a little too easy. I suggest you get this for a toddler, read it to her, then as she learns to read turn it over to her, because my feeling is that it’s best as a starter activity book for the 10 years and younger crowd. Age level: Older elementary aged kids to adults. 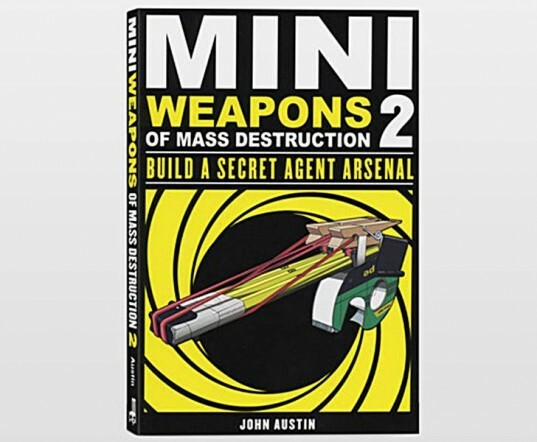 MiniWeapons of Mass Destruction 2 is a hyper cool book for kids who love to build stuff. Step-by-step instructions for 30 different “spy weapons” are included — such as a paper dart watch, a toothpaste periscope, paper throwing star, bionic ear, cereal box briefcase, mint tin catapult and lots more. Almost every single project in this book can be built with easily found recycled items and the instructions are so easy that any kid who can look at pictures and read a bit can follow them. Now, before you freak out and say, “I’d NEVER buy my kid a book that shows them how to build weapons” I’d try to be open-minded and consider the following. Hands down this is my son’s most used book. Though he likes chapter books and other crafty books too, this is his most favorite. Yes, the book is about building little weapons, but there’s TONS of safety info included plus a huge slant towards not using the weapons around others. This book is more of an “experiment with found objects and see how they work” book than a book all about weapons. In my experience, kids will often play pretend guns or spies or war, with or without a book. They may as well own a book that pushes them to be more creative with this type of play. This book has encouraged some major recycling around my house. My son carefully saves trash and recyclables in boxes now to use for building the items he finds in this book. My son’s friend who does not like to read much is 100% enthralled with this book. It’s gotten him to read more and that’s always a good thing. This book not only encourages kids to build the items in the book but pushes them to go above and beyond by designing their own creations and by improving upon the weapons found in this book. My son and his friends have built tons of non-weapons based on the building skills gleaned from this book. Age level: Elementary aged kids to adults. These books are outrageously popular and for good reason. Each is packed with questions and answers, illustrations, images, activities and ideas that are specifically designed to intrigue kids. 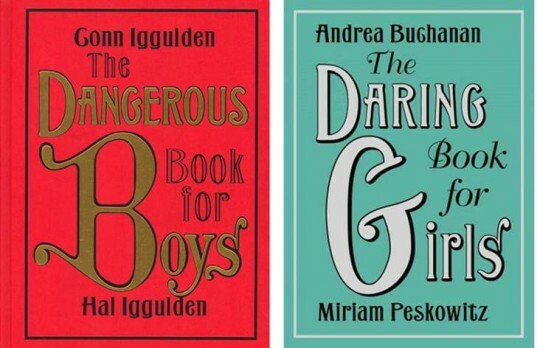 Plus, while these books are labeled “boy” and “girl” really either gender will find stuff to love in each book. The classic book design adds to the charm. Below are some of the activities and ideas covered within the pages of the dangerous and daring book. Age level: Very young toddlers to new readers (1st grade or so). Most of the books in this post are for slightly older kids, but Not a Box is the perfect book to feed your youngest family member’s imagination. First read the book, which tells the story of the not-so-simple box and all the many items it can become if you use your imagination. Then save some boxes and hand them over to your child and see what happens. Maybe your child’s box will become a spaceship, a car, a mountain or a fun costume, just like the little rabbit’s box in the book. 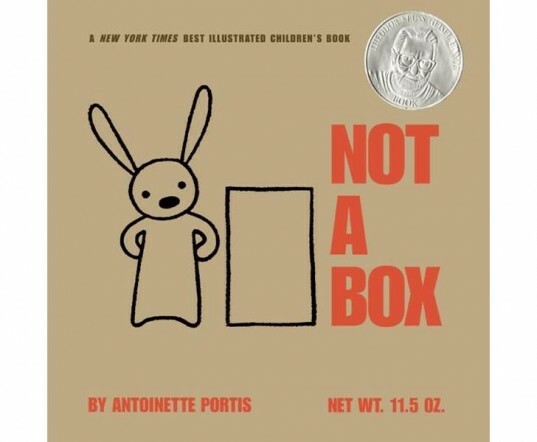 Overall, Not a Box is an excellent starter creativity book. Age level: Elementary aged kids – though teens and adults may enjoy too. Kid Made Modern features 52 enticing, simple to make craft and design projects that kids and even adults will enjoy. Best of all, most of the projects can be made with inexpensive, often recycled materials and little adult participation. 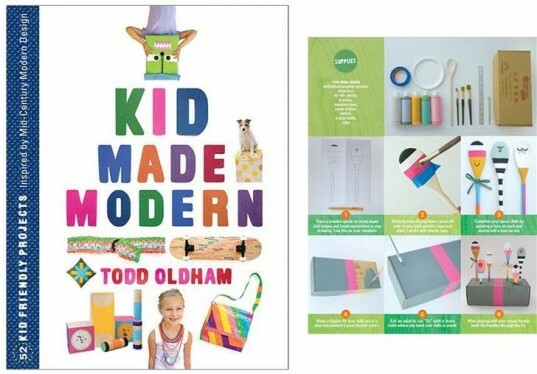 Read our full review of Kid Made Modern. 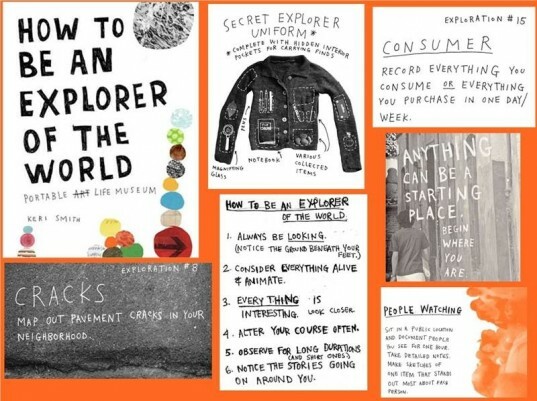 How to Be an Explorer of the World by Keri Smith is one of my favorite books of all time and my son likes it a lot too. This book rocks because it's amazing for the whole family, not just a specific age group. Far too often we ignore the world around us, but this book challenges everyone to observe their world with their eyes wide open. Smith pens various missions that kids and adults can embark on, such as, “Document and observe the world around you. As if you’ve never seen it before. Take notes. Collect things you find on your travels. Notice patterns. Copy. Trace. Focus on one thing at a time. Record what you are drawn to.” The book is highly interactive and contains a slew of amazing hand-illustrated images and photos in shades of black, white, gray and orange. Excess space is offered so that kids can jot down their own ideas and thoughts as well - this book is meant to be used for drawing in, keeping graphs and lists and lots of doodling. Many activities have a "get outside and be active" slant as well, encouraging life participation vs. passive reading. Some prompts include: Start a collection of the first thing you see outside today; sculpt with found objects; collect objects you don't understand; collect multiple rocks - then line them up and find their differences; pay attention more. I recently got a copy of this book and it's amazing. The style is casual and very easy to browse, which is good since there are so many activities included. 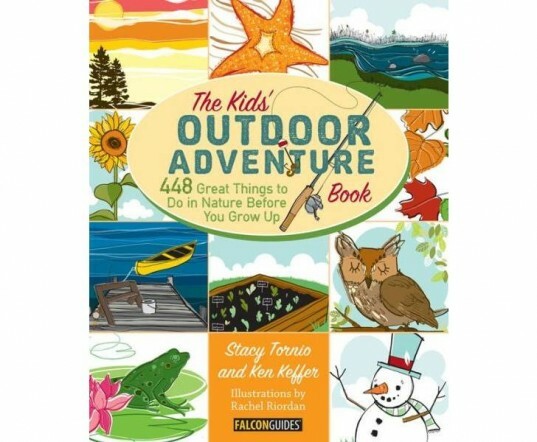 The book is divided by seasons, making it a great year-round outside activity guidebook. Ideas include catching fireflies; making bird feeders; playing marbles; gardening; building a snowman; and so much more. One of the coolest things about this book is that it's designed like a checklist, so kids can actually mark off activities they try. Plus there are added features including fun outdoor destinations and extra resources for parents. Two things you should know about this book. One, some of the activities may seem so simple that you question why such a no-brainer was included. However, kids today don't get outside like we did. Stuff that seemed easy to our generation is often foreign to today's kids. Don't let that turn you away from this book. Secondly, this book is most appropriate for younger kids. My 12 year-old son already gets outside a lot and he found many activities in this book a little too easy. I suggest you get this for a toddler, read it to her, then as she learns to read turn it over to her, because my feeling is that it's best as a starter activity book for the 10 years and younger crowd. These books are outrageously popular and for good reason. Each is packed with questions and answers, illustrations, images, activities and ideas that are specifically designed to intrigue kids. Plus, while these books are labeled "boy" and "girl" really either gender will find stuff to love in each book. The classic book design adds to the charm. Below are some of the activities and ideas covered within the pages of the dangerous and daring book. Most of the books in this post are for slightly older kids, but Not a Box is the perfect book to feed your youngest family member's imagination. First read the book, which tells the story of the not-so-simple box and all the many items it can become if you use your imagination. Then save some boxes and hand them over to your child and see what happens. Maybe your child's box will become a spaceship, a car, a mountain or a fun costume, just like the little rabbit's box in the book. Overall, Not a Box is an excellent starter creativity book. Age level: Elementary aged kids - though teens and adults may enjoy too.